Firstly: Forty days of abstention from sinning. The best [act] one must commit to during this month is abstaining from sinning for forty days. For example, one [could] begin [this task] from the beginning of Rajab till the middle of Shaʿbān [and in doing this] declaring to the Imam of his epoch (Imam Mahdi): "O Master! I have disciplined my self/soul and reduced its entices, so wipe your [blessed] hand on my heart and thoughts." Let your slogan [during this period] be, "O Lord! 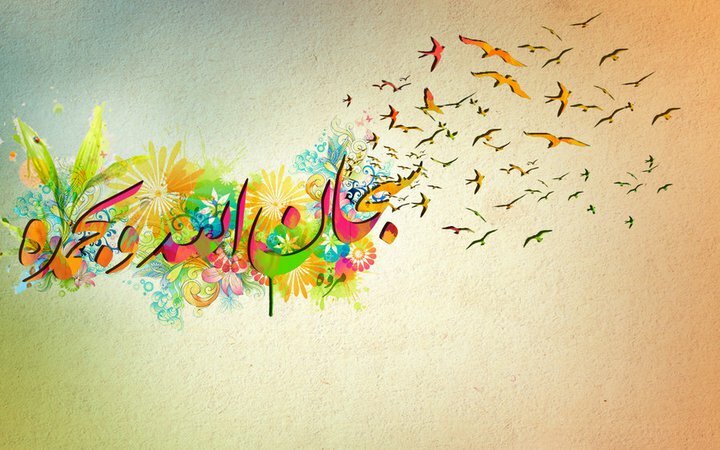 Make this [month] the best month of Rajab that passes me since [the day] of my creation." It is also beneficial for the individual to "deceive" his self, for example, by asking [the self] to commit only for forty days, thus informing it, "O Self! You do not have the strength to be on the moderate path for a full year, so I ask you, O self, to commit only for forty days." The Lord of the Worlds made the season of Hajj (pilgrimage to Mecca) and the month of Ramadan a [few] enumerated days. This is a divine policy, since He knows that humankind cannot bear persistence, hence He lures them and grants them fragments of [Divine] aromas [in order to continue their worsip]. Therefore, he who perfects his conduct during the month of Ramadan and becomes a "servant" of God, tastes the sweetness of Qur'an, and stands steadfast [in worship] during the nights of the month of Ramadan, will persist throughout the whole year [only] with the condition of "tasting/experiencing" [the sweetness of worship] as expressed in the [following] narration: "A body will not become weak where the intention is strong" for if the individual intends, support will come from the Lord of the Worlds. Secondly: Seeking forgiveness from God. The month of Rajab is the month of pleading to God Almighty, for it is narrated that the Prophet [p] had said, "Rajab is my nation's month for seeking forgiveness, so ask for forgiveness plentifully, for He is all-forgiving, all-merciful ... It is also named al-Rajab al-Aṣabb (The outpouring Rajab) because Mercy outpours gushingly upon my nation, so say plentifully: 'I seek forgiveness from God and ask from Him repentance'." Hence, it is necessary that one cleans the abode of his/her soul during this month – [the abode] which was neglected for nine months – by seeking forgiveness, which is, [naturally,] the initial step. Fourthly: Taking advantage of opportunities. This month was labeled as "the out-pourer," because the Divine Mercy outpours upon the nation in a gushing fashion. There is a difference between when a large number of people try entering a slightly opened door, one by one, and when a door is wide open [to] where the people could all hastily enter through it! During the month of Rajab, the doors of Divine Mercy are open. One sin during a month other than Rajab might require seventy istighfars with tears in the middle of the night, with hope that God may forgive us. Whereas, during Rajab, a single istighfar would be sufficient. Hence we must amply recite the following Muhammedan invocation: "Astaghfirullah wa asᶜaluhu 'ltawbah" (I seek forgiveness from God and ask for repentance). As for those who are in distant countries – be it non-Islamic or Islamic – and are a bit lax in their religious affairs, and do not watch over their intake of food and drink, must know that this month is the month of abundant mercy, so wherever you are, take advantage of this opportunity! Fifthly: Committing to the recitation of the prayer specific to this month. In a ḥadīth, Ibn Ṭawūs narrates from Muḥammad b. Thkwān, also known as al-Sajjād (because he would prostrate a lot and cry until he lost his vision) said, "I told al-Ṣādiq [p]:- May my life be your ransom! .. This [month] is Rajab, [so] teach me a supplication that God will benefit me with. He [p] replied, "Write: In the name of God, the Beneficent, the Merciful. Say in every day of Rajab, morning and night, and following the [obligatory] prayers of your day and night, "O He whom I beseech every good from, and I'm safeguarded from his indignation at every evil! O He whom grants plentiful in exchange of a little. O He whom grants he/she who asks [from] Him! O He whom grants he/she who does not ask nor know Him ... (note: we omitted the rest of the supplication since it is available on various English websites- translator). This supplication contains precise points which one must notice. You do not ask God Almighty by your proximity to Him, or by your right to Him; Rather, you know that you are unworthy but [nevertheless] an asker. And the treasury of the Lord of the Worlds is between the kāf and nūn. What would prevent Him from granting you the benefits of the [temporal] world and the afterworld if He so wishes? "All His command, when He wills something, is to say to it 'Be,' and it is." [36:82]. Therefore, you must speak to God Almighty with what makes Him will. So if your heart becomes tender, your eyes [become engulfed in] tears, and you feel something of the signs of acceptance, you must recite the [aforementioned] supplication. Sixthly: Committing to the recommended acts of this month. 1) Repeating the statement of tawḥῑd "lā ilahah illa-llah" (There is no Deity but God) one thousand times during the month. The prophet [p] said, "Whomever says 'lā ilahah illa-llah' one thousand times during Rajab, God will write [for] him/her one hundred thousand good deeds, and build him/her one hundred cities in heaven." 2) Reciting the [Quranic] chapter al-tawḥīd (Divine Unity) one hundred times. Sayyed [Ibn Ṭāwūs) narrates in al-Iqbāl many virtues for reciting "qul huwallahu aḥad" ten thousand, or one thousand, or one hundred times during the month of Rajab. It has also been narrated, "Whomsoever recites 'qul huwallahu aḥad' (Chapter of Divine Unity) one hundred times on a Friday in the month of Rajab would have a [ray of] light that will draw him towards heaven in the hereafter." 3) Committing to the narrated istighfar by saying, "astaghfirullaha la ilāhah illa huwah waḥdahu la sharῑka lahu wa atūbu ilayhi" one hundred times. The prophet [p] said, "Whomsoever says 'astaghfirullaha la ilāhah illa huwah waḥdahu la sharῑka lahu wa atūbu ilayhi' one hundred times in Rajab and concluded it with a ṣadaqah (charity), God will seal [his soul] with mercy and forgiveness ... and he/she who says it four hundred times, God will prescribe for him/her the rewards of one hundred martyrs." 5) It is recommended to pray on every night of the "white nights" of these three holy months. On the thirteenth night: two rakʿas wherein [one should] recite in every rakʿah: al-Fātiḥah (the Opening Chapter) once, the chapters of Yāsīn (Ya sin-36), al-Mulk (The Sovereignty-67), and al-Tawḥīd (Divine Unity-112). On the fourteenth night, one must perform the same prayer with four rakʿas, and six on the fifteenth, performing taslīm after every two rakʿas. [Imam] al-Sadiq [p] said, "Whomsoever performed this will gain the benefit of the three months, and all his sins will be removed except for shirk." Therefore, during the spring season of the souls the believer is walking on the land of treasures. He who is oblivious of collecting treasures will arrive with regret on the day of judgment. However, we must beware of giving too much focus to the reward! Some of us read the reward before the act, and will perform [the act] only if he considers the reward valuable. We are servants, and we must perform our worship duties, [regardless of reward]. The Lord of the Worlds is immensely generous. Do we not say in the supplication, "O He who grants whom does not ask Him and does not know Him out of His Kindness and Mercy?" He who does not know Him is the infidel atheist, yet the Lord of the World gives him [of his benevolence], let alone to a believer!